He can still see the looting; he continues to picture the fires; he still lives through the rioting; to this day Patrick John still shivers as the roar of the riotous crowd rings through his ears. Yes, he can still see it, feel it, experience the revolt that toppled his government in 1979. "Oh, yes, yes," he answered without hesitation when asked if the episode is still vivid in his mind. "I visualize this whole thing as if it happened yesterday afternoon." Today, three-and-a-half decades later, the country's first prime minister is revisited by the demons of his past as the man who so mercilessly led the movement to topple the first post-independence government is elevated to a position John helped create; his nemesis rising to be president of Dominica. And as Charles Savarin prepared to make the transition from uncompromising and unelected –unpopular and unloved, some would contend- politician to become the herald of unending unity, John began to have flashbacks. Once again, the burning of property belonging to supporters of the Dominica Labour Party (DLP), attempts on the lives of others, the looting, the stones, all flash before his eyes. However, the one thing that stands out, frozen on his memory, is the look on Savarin's face as the crowds stormed the government headquarters on this historic morning of 29 August 1979. "I (can) still see him with that broad smile," John told The Sun. "When the police were trying to hold down the gate…and the crowd broke down the gate, that was a proud moment for him." He remembers the scenes so clearly. The police chief pleading with him to call in the defence force, the fear in the eyes of officers, the police detailed assigned to him simply laying down their weapons and walking away, the soldiers opening fire. "All that happened because one man in his quest to put his party in power did all that and didn't care who died and who didn't die." John and Savarin will forever be joined together by the ineluctable facts of history. An unrelenting and militant trade unionist who proudly called himself "The Ayatollah" – a comparison with the then Iranian religious and political leader, the Ayatollah Ruhollah Khomeini, who in 1979 led the overthrow of the shah of Iran and made the country the world's first Islamic republic – Savarin dogged and battered the John government until it collapsed. Of course, John didn't help the situation by enacting draconian laws and threatening to jail striking public servants. But Savarin, as head of the Civil Service Association (now the Public Service Union), was unrelenting. His hostile tactics were similar to those of Ruhollah Khomeini: riots, strikes, mass demonstrations. But while Khomeini led the revolt from exile in Turkey, Savarin was in the thick of things at home. 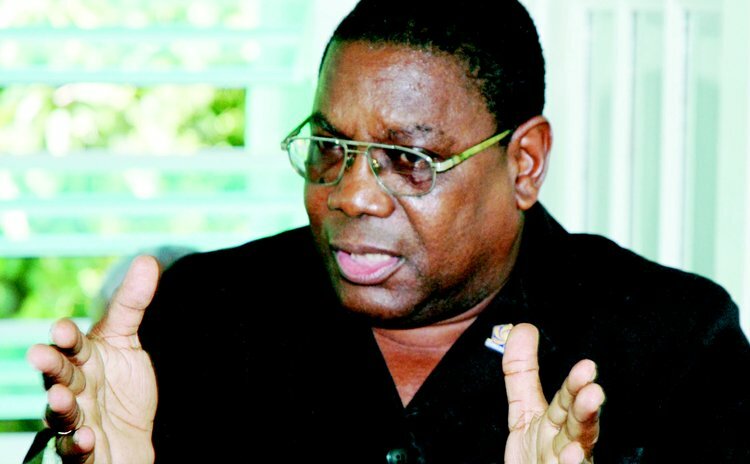 "Every action this man has taken from 1977 to even now…it was setting up Charles Savarin and to bring the (Dominica) Freedom Party to power," the former prime minister said. "He did everything to destabilize my government." For Savarin, John suggested, the end justified the means. His mission was to vanquish the Labour Party and its supporters. And the deposed prime minister had many an example to share: the 47 day strike in 1977 over the CSA's demand for a 121 per cent pay rise, the 1979 strike, the nurses strike over uniform allowances. "The man wanted to use nurses to destroy the economy, going on strike for three dollars. This is the kind of person you are dealing with. A leopard cannot change its skin. Any leader who leads his members to strike and the action goes beyond striking to looting and fires and he (encourages this type of action), this man has no interest in Dominica. Those factors alone should determine he is not qualified (to be president)." Savarin's patterns of behaviour – his hostility towards the opposition, his militancy, his rhetoric (he recently referred to opponents of the ruling Dominica Labour Party as the Taliban), his ruthless determination to quash political dissenters – have become a way of life, John told The Sun. He referred to Savarin's most recent behaviour in parliament where "all his actions were to destroy the opposition". These are not the actions of a man worthy of being president, John said. "How can this man unify the country?" he asked. "(This is) a man who just said to do away with the opposition. He is president now (if there's a dispute between the government and the opposition) what do you expect him to do?" Making it clear that he is no saint, the toppled prime minister indicated that, as a religious person "to a certain extent," he believed in forgiveness, adding that he did not wish on the newly elected president the same thing that Savarin did to John. "(But) I also believe you must never forget the evil that man do to you." And, according to John, Savarin was engaged in sufficient "evil" to leave those watching him take the oath as president without a hint of atonement, feeling rather squeamish. "I felt in his own conscience, what he did to Dominica, what he did to private citizens, what he did to businesses, he should not have accepted it."